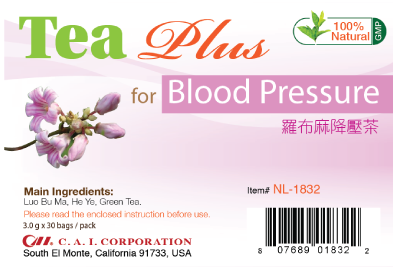 Helps to balance blood pressure. Luo Bu Ma, He Ye, Green Tea. Once per day, after breakfast, brew 2-3 tea bags with hot water (only) for 5-10 minutes and drink the tea warm. Please refill and keep drinking the tea 3-4 times or till the tea becomes flavorless. Not suitable for people under 18 years of age, and women during pregnancy or breast-feeding. 2.5 g x 30 tea bags/box.